I had planned to write one analysis of my favorite works at SPRING/BREAK Art Show. 4-5 installations, tops. But everything changed when I walked into the ethereal office space-turned fairyland that is the SPRING/BREAK Art Show. And that’s because SPRING/BREAK isn’t really an art fair at all. A theme is chosen– this year’s was Stranger Comes to Town— and curators submit proposals based on this theme. Rather than evenly spacing canvases along makeshift white walls, the chosen curators transform their entire given space. This can mean painting the walls of an office red, or lining them with tinfoil. It involves building entire forests from book pages within the confines of a utility closet. Some exhibitors must work around unmovable office furniture. Others are provided with no walls at all– the receptionist’s lobby. The result? Every single installation feels like a mini museum, within which the walls, the floor, the ceiling, the ambiance and of course, the work, should be analyzed. I also have a rather selfish reason for dividing up my posts by installation: I want to be immersed in each world for as long as possible. And by proxy, I’m going to let you do the same. One of my favorite installations, “Belladonna,” was curated by Calli Moore. It features work by Moore as well as Roxanne Jackson, Lauren Clay, and Aliza Morell. Moore was inspired by the witch in society, and what it means to be a woman in power. Powerful women are treated with contradictions. We seek their wisdom, but fear them. We fetishize them, but persecute them. Witches are pushed to the outskirts of society. They become strangers in their own environments, tying their experiences to the theme Stranger Comes to Town. Despite this, witches remain among us- a testament to their resilience and strength. Moore was attracted to this strength, particularly to the strength in numbers as exhibited by the prevalence of covens. With “Belladonna,” Moore has created her own coven. If more magic = more power, then more art = more complex significance and emotional intensity. Moore explains that certain artworks feel stronger together, when exhibited as a whole. She alludes to the alchemist’s practice of combining different elements to create gold. In “Belladonna,” each artist is an element, and the particular combination of work creates something deeply magical and meaningful. 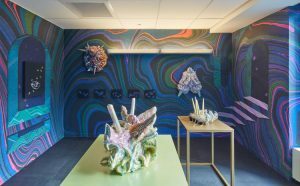 It feels natural then, when examining the different elements of “Belladonna,” to evaluate how the elements work together to enforce the installation’s central theme. Roxanne Jackson was the first artist who signed on to participate in SPRING/BREAK with Moore. Moore had been eager to work with Jackson for some time. Viewing the latter’s work, it’s not difficult to see why. 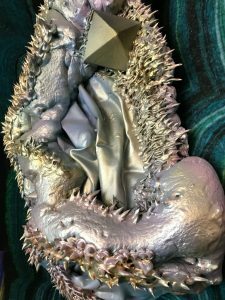 Jackson’s ceramic sculptures are the physical embodiment of the uncanny. Just as a witch dances the line between human and supernatural, Jackson’s sculptures tip-toe on the border of organic and inorganic. Microdosing (2017) is an excellent example. 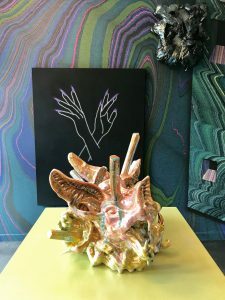 A bizarre medley of ceramic, glaze, luster, and faux fur, Microdosing contains elements that we recognize to be organic, but rearranges them in unrecognizable shapes. The overwhelming presence of musty pink is tongue-like, slimy on the surface but plush to the eye. The color and juxtaposition of soft and hard also remind me of the inside of our mouths. Continuing along this nauseating chain of associations, images of raw meat also pop into my head. Objectively I find it very funny that a color so traditionally feminine as pink is the color associated with animal flesh. The ironies of life. But I digress. Microdosing contains many organic characteristics, including a row of teeth, the indentation of a possible eye, and a series of bone-like structures. It resembles a carcass but none that we can identify. It also possesses otherworldly characteristics, challenging its existence as an object from this world. The prevalence of green and yellow is very strange. What fleshy animal’s dead body would contain streaks of green and yellow? And what dead body shines so incandescently? There is nothing in this sculpture to suggest decay. In fact, I would say the work suggests the opposite. Microdosing seems to be growing. The ‘bones’ also look like genetically modified blades of grass, shooting through the murky soil into the open air. The phrase ‘microdosing’ only complicates the categorization of this creature (in the best way!) Microdosing is the process of administering drugs at very low doses. At the academic level, doing so allows scientists to examine the cellular impact of drug use without causing major bodily effects. Microdosing is also a recreational activity. Someone might choose to take a quarter tab of acid to feel marginal effects if they’re not “in the mood” for a full body trip. 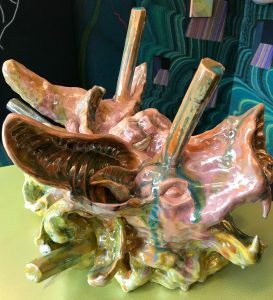 Applied to this work, the term seems to indicate that the organism has undergone some sort of synthetic change. The question at hand, then, is whether this is a chemical or supernatural transformation. An alchemist may argue that there isn’t much of a difference. Witches have been known to transform objects into animals and vice versa… perhaps Microdosing captures the moment a transformation spell has been cast. It is the moment of in-between. Jackson’s Lesser Evil (2018) is less uncanny, but more iconographically witch-like. 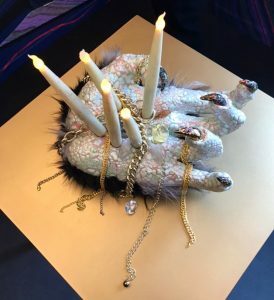 Created from the same combination of ceramic, glaze, luster, and faux fur– plus the addition of chains and LED plastic candles– Lesser Evil immediately calls to mind the supernatural. But instead of guiding us through a string of associations that arouse a sensation of the macabre, Jackson hands us (pun intended) the occult narrative on a silver platter. There is no doubt that this scaly hand with sharp black nails is a product of magic. TV renderings of dismembered body parts in witchcraft have made this association inevitable- think of Thing, the door-opening hand from the Addams Family. The sheer intentionality of Lesser Evil obviates the need to think about whether the work is meant to be occult. We take this as a given and can instead absorb all the material aspects of the work that make it so gripping (pun not intended). We can relish the fake fur beneath the palm, allowing ourselves to imagine a being with scaled hands and furry arms. We visually consume the palm’s scaly surface, drawn to its tangibility. The cracks in the palm and its swollen knuckles make us wonder- how old is this severed hand? Like all ancient things, Lesser Evil must hold some secrets, secrets that we must know. The candles puncturing the hand and the chains draped over its palm feel both campy and ceremonial, like Dr. Frankfurter’s last walk down the aisle in Rocky Horror Picture Show. Though made by the same artist, Microdosing and Lesser Evil represent two different elements in a potion, and two different witch personalities in a coven. Through Moore’s curation they reinforce one another’s power. The obvious occult references in Lesser Evil legitimize the associations one feels encountering Microdosing. This allows the viewer to connect more deeply with Microdosing, feeling its energy sharpen. In return, Microdosing grounds the campy qualities of Lesser Evil, granting the viewer the chance to see it for a piece of honest ceremonial storytelling. Aliza Morell infuses the installation with minimalism, but do not mistake space on the canvas for quiet. Morell’s paintings burn brightly. Their power is different but no less potent. It is drawn from the emotional energy of a single image, and from the intensity of a single color. X (2018) demonstrates Morell’s selective iconography. In careful, thin white lines the artist traces the outline of two hands. They cross at the wrists, forming an X. What does this signal? A figure silently saying no? A figure in the midst of a dance, or perhaps an incantation? 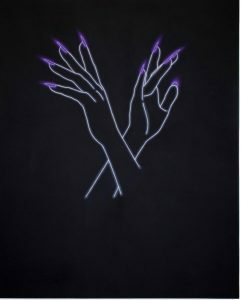 The fingers are long and delicate, with sharp fingernails in a vivid purple hue. They feel feminine, but also seductive, perhaps due to the right hand’s extended finger. It seems to stand alone, ushering a “come hither” that is at odds with the message, “no.” Contradictions are at the heart of how we allow the powerful woman to exist. We fear her (no) but are drawn to her (come). It’s hard to ignore that this is the second instance in “Belladonna” that hands are used as a motif. Should the viewer have happened upon X independently, perhaps they would not read this painting as an expression of a woman in power. However, the iconography in Lesser Evil reinforces the iconography in X, guiding the viewer along an associative path. The result? I cannot view X without feeling the intensity of feminine, supernatural energy. I notice more and more mystical properties in the work because of its context. The color purple is the color of royalty. In absorbing this fact I am more aware of the figure’s powerful presence. Her (I assume her again because of the context) identity is obscured through unnatural means. How could one’s hands light up without shedding light on her face? Again, the sensation of magic abounds. An artist herself, Moore might be seen as the founding witch in the coven. She brought together several other powerful women, and together, their work enhances one another’s spiritually and aesthetically. 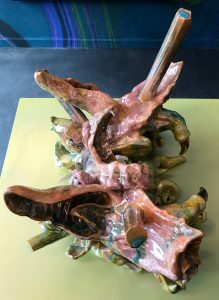 Seen in this light, Moore’s wall sculpture Jessamine (2017) is the original element upon which all the other elements build. Moore used insulation foam to create the foundation for Jessamine. She manipulated the foam during the setting process and again with a knife once it had hardened. She then used fabric and acrylic paint with a frosting tip to introduce texture. 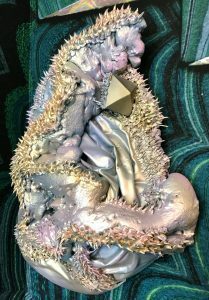 Lastly, Moore applied several layers of acrylic paint to the sculpture with an airbrush, lending it a metallic sheen. Knowing the secret makes Moore’s work no less magical. In fact, unpredictability is a key component of the artist’s process. Due to the nature of foam, the result of the setting and hardening process is fickle. Like a 20th-century surrealist painter, Moore uses this unpredictability to her advantage, allowing new discoveries to inspire her. Jessamine shares many qualities with Jackson’s Microdosing. It is texturally curious, riding the fine line between organic and inorganic. Little spikes of fluorescent foam resemble cilia— the delicate hairlike structures found in our lungs, respiratory tract, and inner ear. Large, bulbous formations have a fleshiness to them that might be human. However, the inorganic properties of Jessamine are very apparent. Microdosing has a shimmering sheen to its glazed surface, but Jessamine is entirely metallic. Its surface reflects light in a myriad of pastel hues. Purple, pink, blue, silver and gold pool together like a stream of crushed amethysts and diamonds. The center of the organism resembles a stack of haphazardly-folded satin. A gold pyramidal structure poking out from the top of the sculpture looks like a giant stud. It is physically painful to look at Jessamine and not touch it. Perhaps that is what makes it so magical. Yes, Jessamine walks the line of organic and inorganic, but not as uncannily as Microdosing. Its coloration and patina sheen are too noticeable– we can’t mistake Jessamine for animal remains or an animal in transformation. We are fully aware of its other-worldly nature due to its intoxicating texture and creamy colors. Jessamine is a tease. It represents the attraction of the woman in power. She is like us but unlike us, and she is untouchable. It would be remiss to discuss “Belladonna” without mentioning the incredible wallpaper designed by artist Lauren Clay. She is the keystone witch, so to speak. Clay’s wallpaper functions as a sort of container for the magic created in the installation. The energy from each work extends outwards, reaches the walls, and is reflected back into the room. No energy is lost out the front door, or into the expanse of a plain white wall. The colors echo the colors created by Moore, Jackson, and Morell. The swirling wall patterns mimic the abstract shapes designed by the other artists. The colorful lines wander with the same soft but steady flow as Moore and Jackson’s growing forms. Clay’s work also suggests something a bit darker about these women of power. Note the purple staircase ascending up to a black door on the right. I can’t help but wonder if this is a portal to a different world. Perhaps one day all the strangers who came to town, the witches of the world, will ascend to a higher calling. I hope you enjoyed reading about “Belladonna” and that you’ve fallen in love with these artists the way I have!! I personally am really drawn to the concept that artworks can reinforce each other and become stronger as a whole. This is something I will take with me as I evaluate further group shows, and in my own curatorial choices. When I exited this space, I felt confident and strong in my femininity and womanhood. Maybe some magic rubbed off on me. Do you feel a tiny bit different…?